RICHLAND, Washington, February 23, 2013 (ENS) – Six single-shell containment tanks are leaking highly radioactive waste at the Hanford Nuclear Site in south-central Washington state, Energy Department officials have discovered. Two-thirds of the nation’s high-level radioactive waste is stored at Hanford, a 586 square-mile site located on the Columbia River. Hanford is the most contaminated nuclear site in the United States and is the focus of the nation’s largest environmental cleanup. 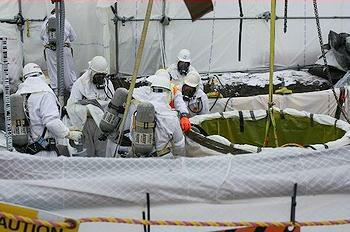 There are a total of 177 underground waste containment tanks at the Hanford site; 149 of them are single-shell tanks. The tank contents include waste from years of World War II and post-war production of material for nuclear weapons and account for 60 percent by volume of the nation’s high-level radioactive waste. Since the beginning of waste removal from Hanford’s single-shell tanks a total of 10 tanks have been emptied. U.S. Energy Secretary Steven Chu told Washington Governor Jay Inslee that one of the Hanford tanks was leaking on February 15. But on Friday, Chu admitted his department inadequately analyzed data that, in fact, shows that six tanks are leaking. “I met with Secretary Chu in Washington, D.C., this afternoon, and he told me that the Department of Energy has now confirmed there are six tanks leaking radioactive waste at Hanford,” said Inslee. “One week ago, Secretary Chu told me there was one tank leaking. But he told me today that his department did not adequately analyze data it had that would have shown the other tanks that are leaking,” the governor said. “I believe we need a new system for removing waste from these aging tanks, and was heartened to hear that the Department of Energy is looking at options for accelerating that process. “Secretary Chu has a long-standing personal commitment to the clean-up of Hanford. He has assured me he will do all he can to address the issue of the leaking tanks. He also assured me there will be immediate additional monitoring of the single-wall tanks,” Inslee said. Governor Inslee is concerned that automatic federal budget cuts due to take effect on March 1 – known as the sequester – will mean workers at Hanford will be furloughed, slowing or halting work to deal with the leaking tanks. Cleanup at the Hanford site is governed by a Tri-Party Agreement among the U.S. Department of Energy, DOE, which operates the Hanford Site, the U.S. Environmental Protection Agency, and the State of Washington Department of Ecology, first signed in 1989. Washington River Protection Solutions, WRPS, is the tank operations contractor for the DOE Office of River Protection, which is responsible for the Hanford cleanup. “Monitoring wells in the T Tank Farm, where Tank T-111 is located, have not identified significant changes in concentrations of chemicals or radionuclides in the soil,” the DOE said. Tank T-111 is a 530,000-gallon capacity underground storage tank built between 1943-44, and put into service in 1945. T-111 currently contains approximately 447,000 gallons of sludge, a mixture of solids and liquids with a mud-like consistency, according to the DOE Office of River Protection. 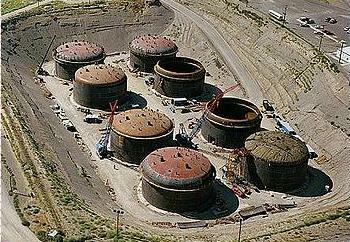 The DOE said this tank was classified as an “assumed leaker” in 1979. In February 1995, “interim stabilization” was completed for this tank, a process that removed the pumpable liquids. After touring Hanford on Tuesday, U.S. Senator Ron Wyden, an Oregon Democrat, said one possibility DOE mentioned is to send waste from some tanks, including T-111, to the Waste Isolation Pilot Plant near Carlsbad, New Mexico. It is a national repository for transuranic waste, which is contaminated with plutonium. The most significant challenge at Hanford is stabilizing the radioactive waste stored in the single-shell tanks. Today, 2.8 million U.S. gallons of liquid waste, together with 27 million U.S. gallons of salt cake and sludge, remains in the single-shelled tanks. 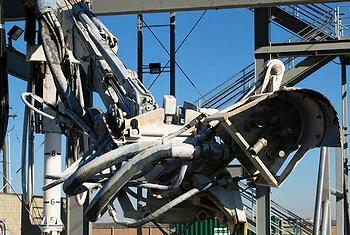 That waste was originally scheduled to be removed by 2018. The revised deadline is 2040. Over the years, about a third of these tanks have leaked waste into the soil and groundwater. Nearby aquifers are contaminated with an estimated 270 billion U.S. gallons of contaminated groundwater as a result of the leaks. As of 2008, one million gallons of highly radioactive waste was estimated to be traveling through the groundwater toward the Columbia River. This waste is expected to reach the river in 12 to 50 years if cleanup does not proceed on schedule. The site also includes 25 million cubic feet of solid radioactive waste.